Ask fellow campers about "Ridgway State Park" and nearby attractions. We were looking for a CG close to Telluride that had electric sites (morning temps below freezing for several days in a row). We're self-contained and don't use the facilities. We stayed on weeknights in mid-October in our 25 foot MH. This is a very nice CG about an hour from Telluride. 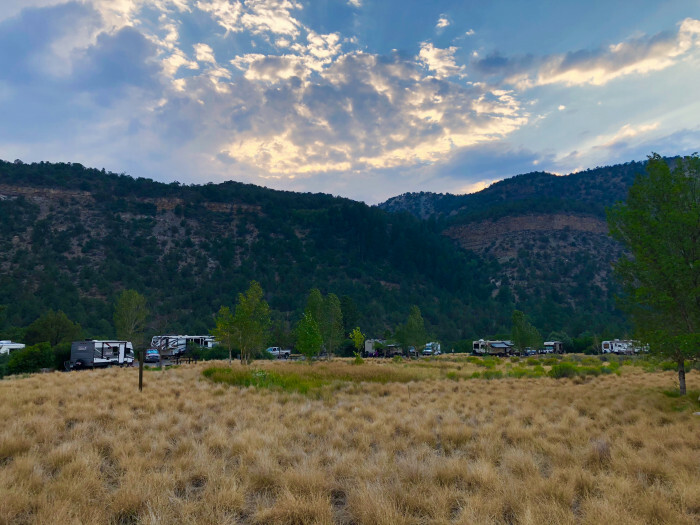 Ridgway SP has 3 camping areas: Pa-Co-Chu-Puk CG with FHU at the Pa-Co-Chu-Puk recreation site and Elk Ridge CG and Dakota Terraces CG, both electric only, at the Dutch Charlie recreation site 3.5 miles south. The sites in Dakota Terrace are arrayed in a meadow in full sun with patio covers over picnic tables for shade. They are closer to the highway with some road noise. The sites in Elk Ridge are in a pinion pine/juniper forest with shade and privacy and no road noise. We stayed in Elk Ridge. The sites are spacious with a mix of pull-ins and back-ins. All are asphalt, some are level while others require leveling. Some have more shade than others and some have views of the reservoir or mountains. There are ample water spigots throughout. There's a dump station with rinse and potable water near the entrance. Note the water at the dump station may be shut off in the event of below freezing weather with water available to fill tanks at the spigots. There's no wifi. There's good ATT and Verizon cell service. Note the A loop of the Dakota Terrace is open year round. The remainder of the loops in Dakota and Elk Ridge begin to close based on weather. There's an extra $7 day fee for those without a CO SP pass. We camped at Ridgway State Park in a Motorhome. There are several short hikes in the park. It's a boating and swimming area in the summer. Nice park below the dam with full hook ups and lots of space, however very little if any shade! The lake was really low and they could use lots of rain and snow over the winter! Nice park to stay in if visiting Ouray, Silverton and the Durango area. The Million Dollar Highway is a very interesting drive, just take your time to enjoy all the views! Also went up over Lizard Head pass to visit Telluride, Co. Just my opinion of course, but I think Lizard Head is the most beautiful pass in Colorado!! We camped at Ridgway State Park in a Fifth Wheel. Lots to see in the area....Ouray, Silverton, Durango, Telluride and some beautiful passes....Million Dollar Highway and Lizard Head, plus the falls in Telluride and of course Black Bear Pass. 4-wheel drive and NOT for the weak of heart!!!!! We stayed for 4 nights in Pa Co Chu Puk G loop. We had a pull through site facing the west with a beautiful view of the mountains and we were away from the main highway. There was a small group of trees planted to the west of our camper that provided shade from the western sun. The concrete pad was level and the full hook ups worked well. The sites are incredibly spacious. The grounds of the campground included access to the river and fishing ponds. The location was perfect for exploring Ouray and Telluride. The price quoted does not include the $16 online processing fee. We had purchased a Colorado Park Pass for $70 (annual fee), so the daily park usage fee of $7 was waived. I can easily say this is one of the most beautiful state parks in Colorado. We camped at Ridgway State Park in a Fifth Wheel. Biking, Birding, Boating, Camping, Canoeing, Canoeing/Rafting/Kayaking, Children's Programs, Cross-country Skiing, Fishing, Hiking/Nature Trails, Horseshoes, Hunting, Nature/Hiking Trails, Nature/Interpretive Trail, Scenic Overlook, Snowshoeing, Swimming, Volleyball Court, Waterskiing, Wildlife Viewing. A nice quiet campground. Different amenities at different sites. We camped at Ridgway State Park in a Travel Trailer. Well laid out state park, sites are very level with fantastic views. Interior roads are easy to navigate, though the individual pull-through sites were a little tight with a larger rig, but still manageable. Each site has a nice level concrete pad and patio, picnic table and fire ring, with a small handful of trees to give a little shade and privacy. Good clean power, only had 30 amp service. There are great trails, ponds for fishing and the Uncompahgre River directly behind the campground for catch and release fishing. The reservoir was very low when we stayed, but we don't have a boat or use the water, so it didn't matter much to us. The views are quite beautiful and a scenic drive can be had in any direction from the campground. We camped at Ridgway State Park in a Travel Trailer. Drives into Ouray, Silverton and Telluride are breathtaking. Montrose is only a 20 mile drive to the north if you need fuel, supplies or groceries. Enjoyed the layout of campsites, we were not crowded and just enough trees to not roast. Water levels were terribly low in all areas, cactus were spread out like land mines so stay on the paths. Beautiful park and a lot to do in the area. We made plans to come again later. We camped at Ridgway State Park in a Travel Trailer. Ouray for 4 wheeling, shopping, hiking. Ridgway for area restaurants and museums. Montrose for restaurants and inexpensive shopping areas. Many others have reviewed the basic amenities of this park. The only thing to do in the park is fish in the designated reservoirs or the Uncompahgre River, or hike one of the few very easy trails in the campground. This serves as more of a camping spot to access either the town of Ridgway or, more likely, the town of Ouray, about a 30-minute drive from the Pa-Co-Chu-Puk campground. Full hookups is a real plus, but having only 30 amp rather than 50 amp was disappointing. In addition, although the sites are nicely spaced there is no shade to be had in most of them. In the heat of summer you can really bake. 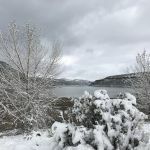 The reservoirs were shockingly low during our visit, the result of long-standing drought in the state and a low snowfall from the previous winter; the melting snowpack being a major source of water in that part of the state during the summer months. Certainly not the fault of the park, but it detracted from the overall atmosphere. 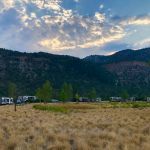 My wife and I checked out several other RV parks in the Ridgway/Ouray area and found only "sardine parking lot" types, so Ridgway State Park is really the best option in this part of the state. We camped at Ridgway State Park in a Fifth Wheel. Spend most of your time in Ouray, the "little Switzerland of America." It is a stunning location. Take one of the "Jeep" tours up the old mining roads, ride horseback at Action Adventure Trail Rides, hike any of the incredibly beautiful trails outside of Ouray, and enjoy a delicious meal at Brickhouse 737 Restaurant or a cold draft beer at Ouray Brewery. Ouray is only about four blocks from one end of town to the other. We stayed in the lower Pa-Co-Chu-Puk campground. Our site was a concrete paved, dead level, open site with full hook-ups, a shade tree, fire pit and picnic table. There was plenty of room between sites. Ours backed right to the Uncompahgre River. This is a beautiful, well maintained park in a beautiful area. There is no WiFi and T-Mobile didn't have bars. However, the fishing was great. We camped at Ridgway State Park in a Motorhome. Beautiful State Park divided up into multi-segment campgrounds. This review is for the Pa-Co-Pu-Chuk section loop G. This is the full service section of the campground with 30 amp service. We had a back in site with a partial view of the river. This view would not have been available if the trees had leafed out. The site had a level cement slab and patio area which was equipped with a metal picnic table and fire pit. Utilities were placed at the rear of the of the site but were easily accessible with our electric cord. Sewer drain took an extra extension of drainage hose. There was no OTA television service and no cable. Verizon had sporadic service and there was no reception for AT&T. There were walking trails to the river and to the beautiful fishing pond in close proximity to the trailer. 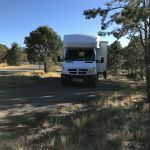 The area around the trailer had clumps of grass, dirt, sagebrush and many low-growing cactus which are difficult to see. The camp hosts were friendly and helpful and checked in with us on arrival. They have firewood and ice for sale. There is a camper services building which contains the laundry and showers. Bathrooms were somewhat far from our site. Be prepared to pay $7 a day for the Colorado Park fee or purchase a yearly park pass for $70. We found this a convenient base to explore the mining region and would stay here again. We camped at Ridgway State Park in a Fifth Wheel. There was a small well-stocked grocery store in the town of Ridgeway. Both Ouray and Silverton were quaint small towns. At this time of year most of the museums and shops were closed or had very limited hours. the town of Montrose is much larger with all of the usual chain stores and is 26 miles away. I stayed here the first week of October 2017. In addition to the nightly fee, Colorado requires a $7 a day entrance fee...........or one can purchase a yearly fee for $70. I opted for the latter because I thought I was going to stay longer than 10 days. Rain chased me out in 6 days, but the pass is good for any Colorado State Park for a year from purchase date. I plan on staying in the park in the future. We camped at Ridgway State Park in a Travel Trailer. Ridgway State Park is 20 miles south of Montrose in western Colorado on Ridgway Reservior. We spent 4 nights in the Dutch Charlie campground site 186 (30A electric site) in the Elk Ridge section. Spacious campsite with beautiful views. Pa-Co-Chu-Puk campground north of the lake on the Uncompahgre River has full hookup sites. Ridgway is 4 miles south with a few restaurants and basic groceries. Montrose is 20 miles north with Walmart and City Market grocery stores. 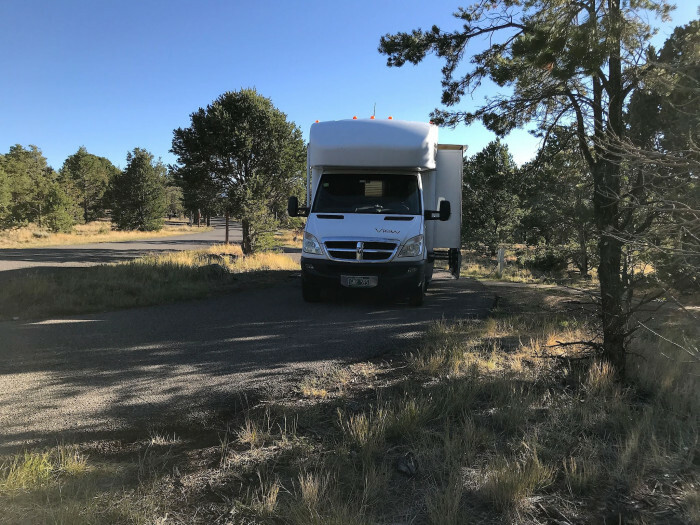 We took the scenic drive over Owl Creek Pass (good dirt roads) and also visited Black Canyon of the Gunnison National Park. Beautiful campground and area. We would stay at Ridgway State Park again. We camped at Ridgway State Park in a Fifth Wheel. We spent two weeks at this park and enjoyed it more the longer we were there. Very large park with multiple campgrounds and multiple loops within those campgrounds. We stayed in the Pa-Co-Chu-Pu campground, so this review is specific to that one. Mostly pull through sites and many had vegetation between the road and pad for an extra element of privacy. The pads are not overly long or wide for big rigs. We had to wedge our 43' RV in with some back and forth adjustments. We still couldn't fit all tires on the concrete, but not to worry since the rest of the parking area is blacktop. Sites vary a lot and ours was long and narrow, but with a really nice concrete sidewalk between the door area and the outdoor space situated at the rear of the RV. You do get pretty consistent road noise from the highway, but depending on site, it's not horrible. When picking a site, the ones closest to the river are quietest and most of those offer more afternoon shade which is nice. This was our first time to this area and we loved it. A couple of dings. There were dog bag stations, but no waste bags anywhere. A few plastic shopping bags crammed in them though. Sites are 30 amp only which wasn't enough to run more than one AC. It did cool off nicely at night though. Good AT&T signal, ok Verizon signal. We had clear sky for satellite. We will stay here again. We camped at Ridgway State Park in a Motorhome. Ouray, Silverton, and Telluride areas are incredibly beautiful with amazing Jeep/ATV trails. Gorgeous hiking trails nearby as well. Except for the Friday Farmers market (which is very nice) in Ridgeway, skip shopping there and instead drive to Montrose for better grocery stores and a nice selection of big chain stores. This is the third year we have stayed two weeks at Pa Co Chu Puk where they have the full hookups. Camp hosts were very friendly and helpful. Nice trails to hike and it's off the beaten path where we can relax and enjoy nature and all the beautiful scenery. It's also a great base camp to go visit Silverton, Telluride, Ouray and many other nice attractions in the San Juan Mountains. We camped at Ridgway State Park in a Travel Trailer. Telluride, Ouray, Silverton, and many other attractions. We always eat at least once at the True Grit Cafe in Ridgway every time we visit. .We camped here for 5 days while exploring the area. As with most Colorado state parks this one is top notch. Our site 113 in the Elk Ridge section was quite secluded with picnic table and fire ring, but did need some serious leveling on our part. Hard to see your neighbors. The restrooms (pay $ 1.00 showers), showers and laundry were all clean and well maintained. The location is perfect for exploring the area with Ouray only a 15 min ride away. If in the area we would stay here in a heartbeat. momdoc. We camped at Ridgway State Park in a Motorhome. Nice park, good views. We stayed in the full hookup part which was nice in July to have A/C. We camped at Ridgway State Park in a Motorhome. Ouray, Telluride, Ridgway and lots of hiking trails. Ouray, Silverton, and Telluride areas are incredibly beautiful with amazing Jeep/ATV trails. Gorgeous hiking trails nearby as well. Except for the Friday Farmers market (which is very nice) in Ridgeway, skip shopping there and instead drive to Montrose for better grocery stores and a nice selection of big chain stores. Close enough to Montrose for shopping. Go to the Ouray hot springs pool. Jeep trails, hiking trails and fishing. Be sure to try Horsefly Brewing Company in downtown Montrose. It is unassuming from the outside but we had a great lunch there. Orvis Hot Spring was just a short drive away. Ridgway farmers market on Fridays is great. Sites 271, 273 and 274 sit above the river with a view of it. If you are not afraid of heights, take a guided Jeep tour over the rugged San Juan mountain passes from Ouray to Telluride. We used Switzerland of America Jeep Tours in Ouray--great way to spend the day. Also the True Grit Cafe in Ridgway has great food and friendly service. If you need to do some provisions shopping head up to Montrose which is about 20 miles north. Much better selection of stores and prices much more reasonable than down in Ridgway. The only food store in Ridgway other than the Dollar General is the Mountain Grocery store which is ridiculously overpriced. Even the locals joked about their pricing. Be sure to check out Box Canyon in Ouray, and some of the hikes around Ouray. The visitor center in Ouray is very helpful. It is an easy day trip over to Telluride. There is a grocery store in Montrose plus a WalMart. Telluride, Ouray, Montrose close by. True Grit restaurant in the town of Ridgeway is a must! Great food. Ridgeway is a great base for exploring the area around Ouray or going over the Dallas summit to Telluride. There are so many things to do that we plan to come back again! We did a jeep tour out of Ouray and visited Black Canyon of the Gunnison. 22 south of Montrose and its Super Walmart. 14 miles north of Ouray and some the best Jeep trails in Colorado. Great fly fishing a walk from your camping site. Ridgeway reservoir available for swimming and boating down the road 3 miles where a second Ridgeway State Park is located along with the park Visitors Center. Telluride, Ouray, and Black Canyon of the Gunnison are all within easy driving distances each day. The lake and the river below both offer good fishing. 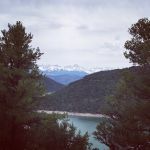 This park is expensive for what you get, the only redeeming quality is that it is close to Telluride, Ridgway and Ouray, and cheaper than anything comparable in the very immediate vicinity. There are several RV parks near Montrose. I would suggest you stay at one of those, and do the extra driving for the sites. Ouray hot springs. Close to Telluride. Close to Black Canyon of Gunnison. Are you affiliated with Ridgway State Park ?